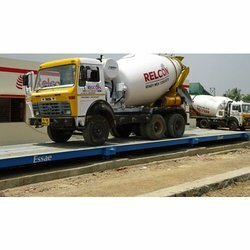 Pioneers in the industry, we offer pitless weighbridge from India. Our range of Pitless Weighbridge process enable you to weigh pig iron as it travels from the steel plant to the blast furnace. You don't waste any time as it's fully automatic and doesn't require a scales operator.Our Tank Weighing Systems are designed for weighing amount of liquid or solid material filled into or discharged from industrial tanks, silos, bunkers and mixers. We have the expertise to commission the systems for any type of applications such as normal, hygienic, high temperature, hazardous, corrosive, etc. Our unique concept of using pad plates ensures quick and accurate installation of load cells. Looking for Pitless Torpedo Weighing ?